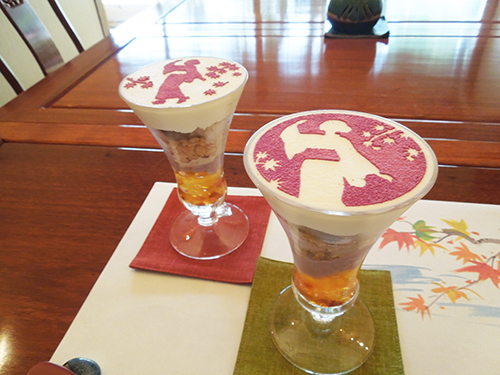 It is seasonal and special menu “Sougian autumn parfait”.It taste of autumn and there are to match well, Chestnuts, Ice cream, Red bean pudding, and Thick whipped cream.It looks as enjoy as taste, there are drawing “Gujo-Odori” printed maple design. 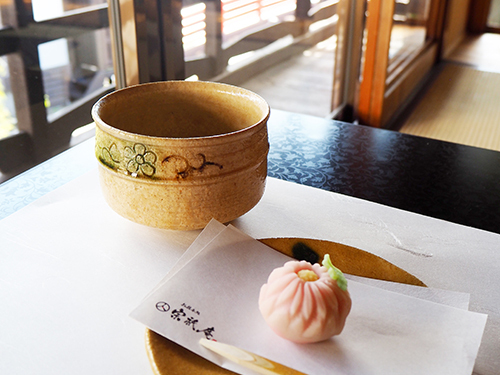 “Sweet chestnut” is a Japanese sweet that fits well for matcha. 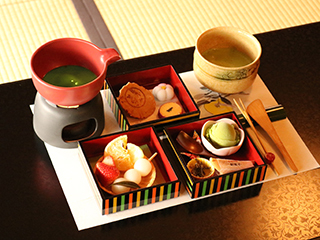 It is green tea chocolate fondue to enjoy with strawberries, dried fruits, dumplings and rice crackers. It is handmade“Red been soup”cooked in a shop. ※ Roasted tea is attached. Roasted tea jelly, green tea pudding, rich matcha ice cream, red bean paste,sticky rice flour dumplings, etc. are made into layers, and on the top is the original thick cream. To finish drew matcha art that imagined Gujo dancing. 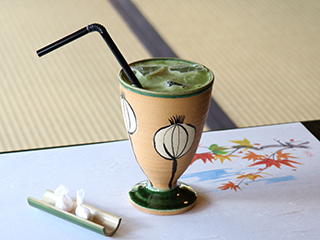 It is matcha which we can only taste here using pure water from Gujo. 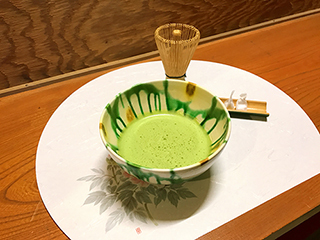 It is a luxurious matcha latte which used the highest grade Japanese sugar “Wasanbon sugar” and matcha produced in Gifu prefecture. 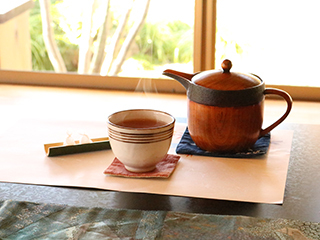 Roasted tea using “Onabi tea” cultivated in mountainous areas of Gujo. 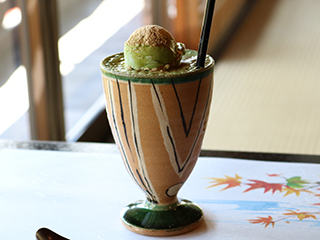 Wasanbon matcha latte with rich taste matcha ice cream,brown sugar and unique article roasted soy flour. 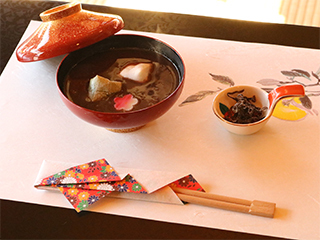 Please enjoy the elegant sweetness of “Wasanbon sugar” and the harmony of bitter smell of Roasted tea. 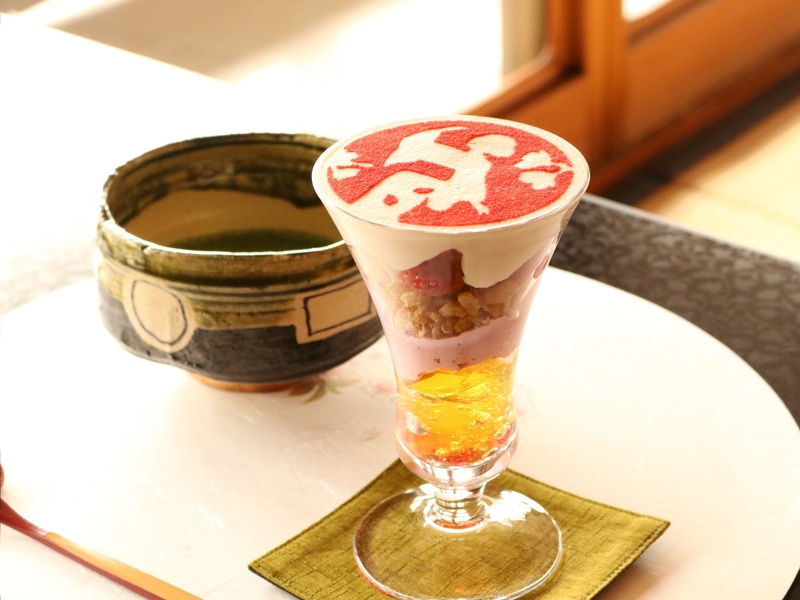 It is seasonal and special manu “Sougian spring parfait”.It taste of spring and there are to match well, cherry blossom syrup,mixberry pudding,storowberry, and cherry blossom sticky rice cake ice cream. 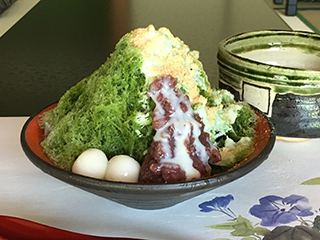 Special made Matcha shaved ice “Castle in the sky”. 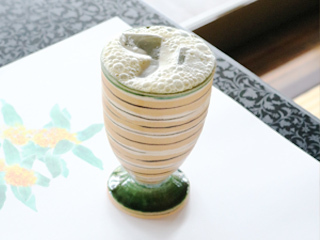 Shaved ice with condensed milk and oasted soy flour and powdered green tea syrup. 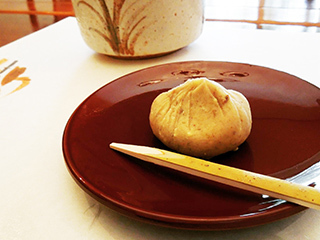 putting red bean paste and rice-flour dumpling,Its name is”Castle in the sky”. Imagined Gujo Hachiman Castle rising in the clouds. 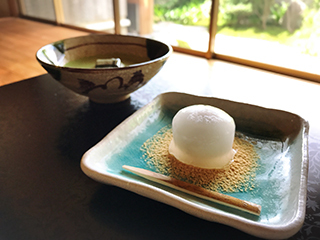 A ball of bean paste covered with a kudzu starch glaze of traditional Japanese-style confectionary. 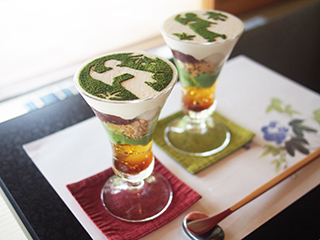 It is a summer desert that fits well for matcha.